[134 Pages report] The size of the global nuclear decommissioning services market is estimated to be USD 4.84 Billion in 2016, and is projected to grow at a CAGR of 12.1% from 2016 to 2021, to reach USD 8.55 Billion by 2021. Nuclear accidents, such as the Fukushima Daichii nuclear power plant accident in 2011, and rising political pressure for pre-closure of nuclear power plants, especially in the European countries, are expected to drive the market. This research study involved the use of extensive secondary sources, directories, and databases such as Hoovers, Bloomberg Businessweek, Factiva, and OneSource to identify and collect information useful for a technical, market-oriented, and commercial study of the global nuclear decommissioning services market. Primary sources are mainly industry experts from core and related industries, preferred suppliers, manufacturers, distributors, service providers, technology developers, standard and certification organizations of companies, and organizations related to all the segments of this industry’s value chain. The points given below explain the research methodology. After arriving at the overall market size, the total market has been split into several segments and subsegments. The figure below provides a breakdown of primaries conducted during the research study, based on company type, designation, and region. The ecosystem of the global nuclear decommissioning services market starts with decommissioning service providers that include prominent global players as well as small and medium enterprises. Key contracting agencies include Areva Group (France), Babcock International Group PLC. (U.K.), Studsvik (Sweden), AECOM (U.S.), and Westinghouse Electric (U.S.). Global companies, given their wide geographical presence and extensive network, provide services themselves and through a larger network of third-party agencies. The end-users of decommissioning services include nuclear power plant operators and government bodies. These end-users offer contracts to service providers for decommissioning, such as Areva Group (France), Babcock International Group PLC. (U.K.), Studsvik (Sweden), AECOM (U.S.), and Westinghouse Electric (U.S.). The global nuclear decommissioning services market is projected to reach USD 8.55 Billion by 2021, at a CAGR of 12.1% from 2016 to 2021. This growth can be attributed to nuclear accidents and rising political pressure for pre-closure of nuclear power plants. The report segments the nuclear decommissioning services market based on reactor type into water cooled and gas-cooled reactors. Water cooled reactor has been further segmented into Pressurized Water Reactor (PWR), Boiling Water Reactor (BWR), Pressurized Heavy Water Reactor (PHWR), and other reactors. The BWR segment held the largest market size in 2015, as it is used in majority of the nuclear power plants. The nuclear decommissioning services market has also been categorized based on capacity into up to 800 MW, 801 MW–1,000 MW, and above 1,000 MW. The nuclear power reactors up to 800 MW are expected to occupy the largest market size during the forecast period, due to pre-closure of nuclear power plants, whose capacities were below 800 MW, in the European region. 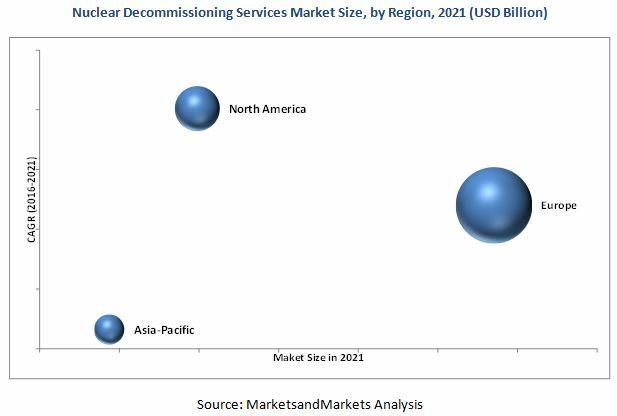 The nuclear decommissioning services market has also been segmented based on strategy into immediate dismantling, deferred dismantling, and entombment. The immediate dismantling segment is expected to occupy the largest market size during the forecast period, due to early phase-out of nuclear power plants in the European region, especially in Germany and Italy. Europe held the largest market share, followed by North America and Asia-Pacific. In 2015, Germany dominated the European nuclear decommissioning services market. This can be attributed to government support, followed by public concern for pre-closure of nuclear power plants. Meanwhile, the market is estimated to grow the fastest in Asia-Pacific, owing to more number of nuclear power plants in Japan and South Korea. The figure given below indicates the market size of various regions by 2021, with their respective CAGRs. The decommissioning cost on an average ranges in between USD 600 Million to USD 750 Million. However, the actual cost incurred can be more than the average estimated cost since many factors are involved in decommissioning a nuclear power plant. These factors are restraining the growth of the market. Some of the leading players in the nuclear decommissioning services market include Areva Group (France), Babcock International Group PLC. (U.K.), Studsvik AB (Sweden), AECOM (U.S.), and Westinghouse Electric (U.S.), among others. Contracts & agreements was the most commonly adopted strategy by the top players in the market, followed by expansions and other developments. 12.4 Babcock International Group PLC.